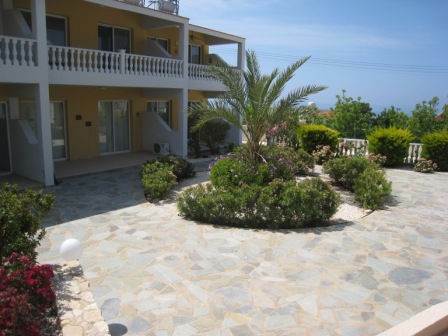 Peyia, Paphos - This first floor apartment is located in the popular village of Peyia, only 5 minutes from Coral Bay beach, 20 minutes from Paphos town, and 20 minutes from the tourist area of Kato Paphos. The accommodation features an open plan living area with end kitchen, a double size bedroom with fitted wardrobes, and a family bathroom. Patio doors from both the lounge and bedroom open on to a spacious terrace with side sea views. It is in a well maintained complex and has an attractive communal pool. Great as an investment property, or a holiday flat. Enjoy a relaxed lifestyle in a great community!